Mike Pence the vice presidential candidate for the Republican Party declared that birtherism, the thought that President Barack Obama was not born in the U.S., is over. Pence said he believes Donald Trump the GOP presidential nominee put an end to the issue. He was referring to the brief statement Trump made last Friday that acknowledged the president was born in the United States. Pence acknowledged that before Trump did, telling a group of reporters earlier this month that he believed that Obama had been born in Hawaii. However, now Pence said that both he and Trump acknowledge it without any hesitation. Pence did dispute the idea that the presidential candidate for the GOP is responsible for continuing the notion Obama was born outside the U.S.
Trump pushed his birther idea for over five years after the 2011 release by Obama of his birth certificate in long form. Pence said the birther movement did not start with Trump, but is traced back to the 2008 campaign of Hillary Clinton. Pence added that birtherism was a secondary issue and that the people of America were not focused on debates that took place in the past. 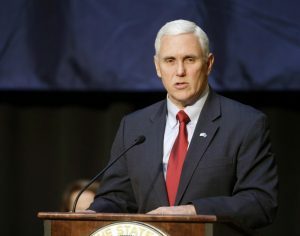 When Pence was asked about the denouncing of Trump by former Defense Secretary Robert Gates as being unfit and unqualified to be president, Pence said that Gates had been wrong. Pence said he had a great deal of respect for former Secretary Gates and had worked with the secretary during his years as a member of the foreign affairs committee. However, he called Gates just wrong. Pence wanted to explain what Trump had meant on Friday when he had said that the contingent of officers in the secret service for Clinton should disarm and then see what will happen to her. The GOP vice presidential candidate explained that he thinks Donald Trump was saying that if Clinton did not have the security detail she does, that she would probably be a lot more supportive of the Constitution’s second amendment. He added that the allegations that Trump had been inciting violence against Clinton were complete nonsense. Pence added that the comment Trump made was if Clinton did not have the security, she does than her attitude would change about citizen’s rights to bear arms. Pence concluded by saying he bets that is likely true.